The McAleese Group’s Resources arm won a new contract with Gold Fields Australasia in the east of Western Australia. The five year contract will involve loading and hauling about 5 million tonnes a year of ore as well as a range of ancillary surface mining services for Gold Fields’ St Ives gold mine. "Our new partnership with Gold Fields will see further expansion of our existing haulage business in Kalgoorlie, Western Australia and is a key milestone in our growth strategy McAleese Group CEO Paul Garaty says. "Since we acquired McAleese Resources in 2012, the business has grown by more than 10 per cent, and we look forward to continuing this growth both in our existing locations and new geographies across Australia." The St Ives operation is about 20 km south east of Kambalda and 70 km south east of the McAleese Resources' Kalgoorlie branch. The contract involves the provision of tasks including; loading and haulage using a fleet of eight quad road trains, operation of ten front end loaders for loading and crusher feed, product screening, and road maintenance. "We'll be using a combination of new and existing fleet for this job," a spokeswoman says. quad set of highway registered trailers. 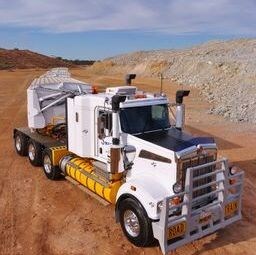 The McAleese Resources business provides bulk haulage and ancillary on-site services to mining companies in Australia. It also provides road base material used in the construction of mine haul roads, and ballast for railroads from an owned and operated quarry, located in north-western Queensland. While the edge might be coming off the WA mine development boom, extraction continues and McAleese Resources has been well placed for that in the region.